Graham Matsalla actively commuting at Southport Tower. It’s not always easy to maintain a physically active lifestyle. That’s why Alberta Health Services (AHS) aims to inspire Albertans to be more physically active this summer and to seek a healthy balance in their daily lives through our What’s Your Balance? wellness initiative. 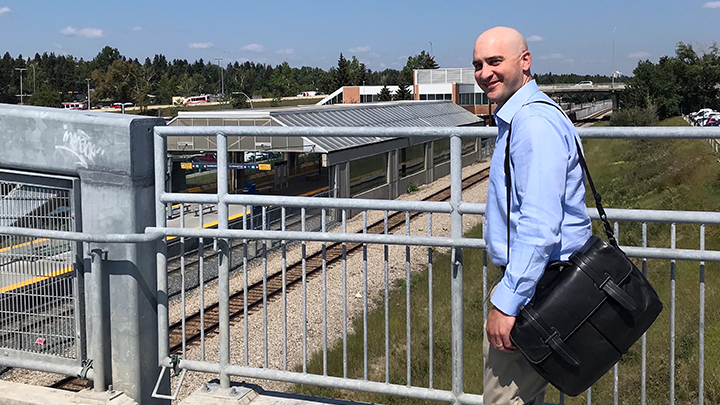 This August, AHS wellness teams will launch the first Energize Your Commute Week — to run Aug. 27–31 — to highlight the benefits of moving more during the workday. Energize Your Commute Week will focus on active transportation during your daily commute. Active transportation refers to any form of human-powered transportation including walking, running, cycling, snowshoeing, skateboarding and using manual wheelchairs. It’s all part of AHS’ commitment to encourage Albertans to be co-partners in their healthcare and focus on preventative steps they can take. “By changing how you commute to and from work, you’re increasing your chances of meeting the recommended 150 minutes of moderate- to vigorous-intensity aerobic physical activity per week,” adds Matsalla. Activities such as deciding to park further away from the office, get off a transit stop earlier or walk to work can have a huge positive impact on your overall health and wellness. Regularly meeting the Canadian Physical Activity Guidelines and reducing time spent sitting brings great health benefits, and reduces the risk of cardiovascular disease, type 2 diabetes, obesity and some forms of cancer. All Albertans are encouraged to join in on Energize Your Commute Week — and try something new and different when it comes to their health. Please note: Due to the wildfire smoke, follow your local advisories and recommendations for outdoor activity. Learn more about how you can get involved with Energize Your Commute Week. Learn more about this month’s theme and share what balance looks like to you using #AHSwhatsyourbalance on social media. Or visit www.ahs.ca/whatsyourbalance to download the Wellness Scorecard. Get started on your path to finding balance.